1. 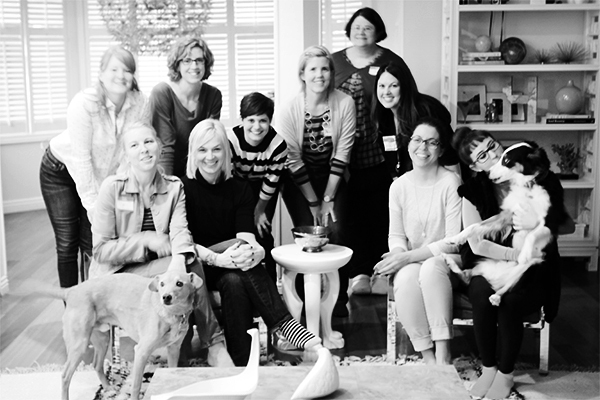 Last week, after Alt, I held a mini design camp in Salt Lake City at a nice person's house. It was so much fun -- a small, funny, sweet group of ladies attended, and there were many fun times and drinking of champagne and learning of things. Also: RIBS. Heather's friend Kate -- along with her adorable husband -- fixed us the most amazing lunch of ribs, macaroni & cheese, and salad. Oh, and some kind of crazy double chocolate chocolate chip (with a side of chocolate) cookies. Thank you so much, Kate! I hope to one day return the favor, in the form of a pony, or a big box of money, or maybe a BRAND NEW CAR. Campers + Chuck + Coco = LOVE 4 EVER. Photo by Intern Beth. Another huge thanks to Heather, Tyrant, and Intern Beth + Zac Efron. 2. Los Angeles is this weekend, what what! And I want you all to be there. Would you like to be there? Would you like 15% off? Then please accept this coupon code: DCLA15. Thank you. I accept you. 3. Due to circumstances beyond my control, Dallas has been put on hold until further notice. It IS happening -- it's just not happening on March 2. Please accept my deepest apologies, and watch this space for updates. 4. Thank you to everyone who has signed up for camp this year! I am so excited about you. And, hey, Denver, Boston, and Minneapolis: see you SO SOON! 5. Speaking of those three cities, I am still working out details and scouting spaces. Can you help? Do you want to intern? Would you like to work together to promote your company + make camp pretty? Get at me.